All photography in this post by Jon Bolden. Hi everyone! 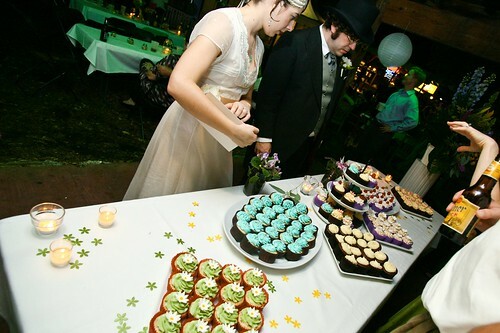 I had the very good fortune to provide the celebratory cupcakes for Kaci & Roy’s wedding in September… I have to say that they are truly two of my very favorite clients. To meet them is to love them. 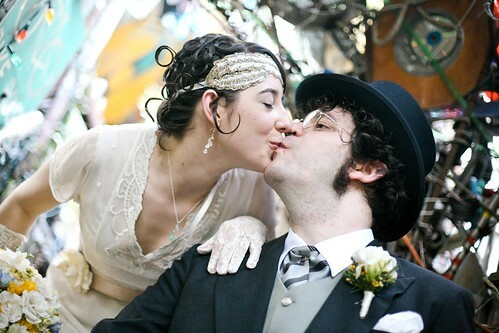 For their wedding, Kaci and Roy were extremely creative and they worked to have a ceremony (at the Cathedral of Junk) and reception (at Hill’s Cafe) that was warm, welcoming, and whimsical - a perfect fit for the couple. Kaci was kind enough to share some pictures of the evening with me, and I’ve included them here for you to check out. Jon Bolden took the lovely photographs - all the credits for this post go to him! Seriously, these are hands down the best g-damn cupcakes, with the best cake and frosting I’ve ever had in my whole life. I thought I didn’t really like cake all that much until I had these - rich, moist, with light and flavorful frosting. Highly recommended!!! 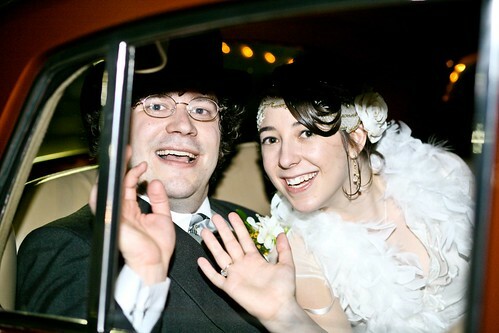 Kaci and Roy - I’m so, so pleased to have been a part of your big day! All the best! Halloween’s-a-comin’… For a casual get-together with friends last night, I made some simple little cupcakes in the style of Martha Stewart. The cupcakes were sour cream chocolate cake with orange-tinted cream cheese buttercream. 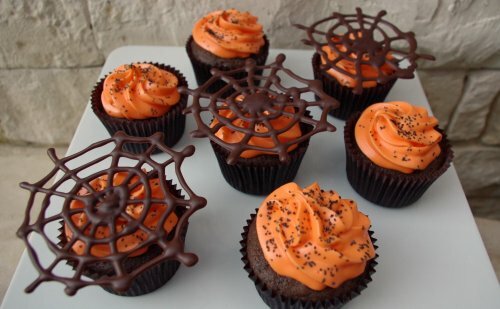 The cupcakes were topped with sanding sugar and handmade dark chocolate spider webs. Happy Friday, all! Just wanted to let you guys know that I’ll be hitting the road tomorrow morning representing Wicked Cakes in the Austin LIVESTRONG Challenge 5k. If you’ve got some time on Saturday, come on out and cheer on the crowd! Information about the event is on the LIVESTRONG Challenge website. 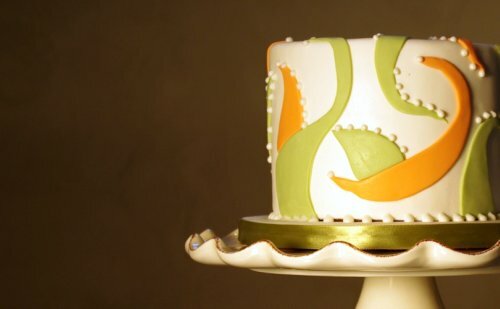 Over the weekend, I created this little swirly design over the weekend… it’s decorated in vanilla fondant and accented with piped royal icing dots. Cake Wrecks at BookPeople in Austin! What a fabulous event on Saturday! Thanks to John’s ongoing recovery (yay! 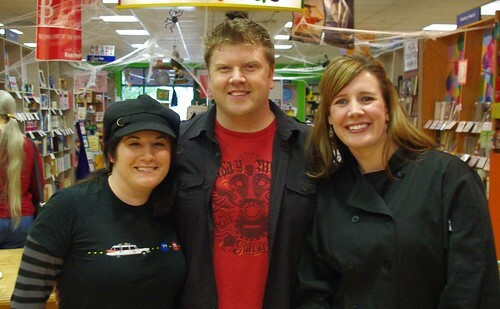 ), Jen & John were able to reschedule the Cake Wrecks book book signing event for Austin, and we had the opportunity to hang with them on Saturday. I have to say that Jen & John are just as lovely as you’d imagine - super-friendly and a joy to listen to. Nicole had a blast meeting fellow Cake Wrecks fans and enjoying delicious cake! 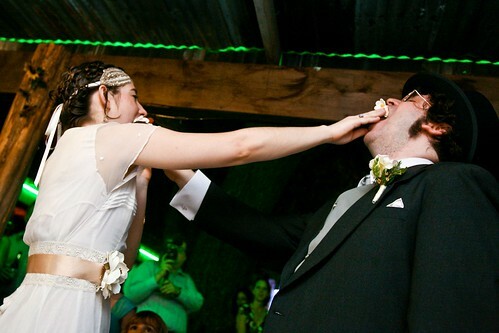 Jen & John, you’re welcome in Austin anytime you like! All the best, and John, get well soon! 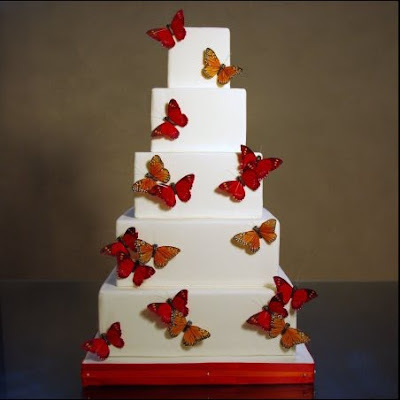 Natalie & James Wedding Cake! 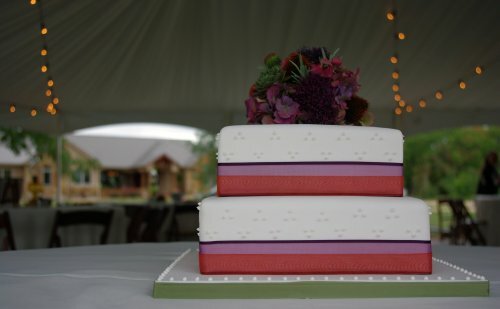 This wedding cake design includes a two-tier square cake accented with royal icing dots, sheer ribbon, and a beautiful floral topper by Georgetown’s A Matter of Taste florists. Good morning! I realized last night that, in the midst of all the craziness, I neglected to share the post that Jen of Cake Wrecks did on Wicked Cakes. It was a fantastic post, and I’m so grateful to all the Cake Wreck readers who posted such nice comments about my cakes! 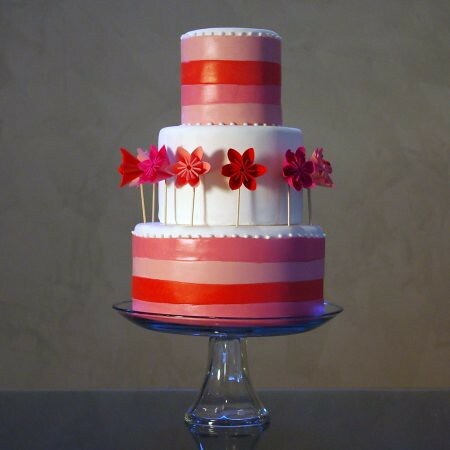 Cake Wrecks Austin Stop Rescheduled — This Saturday! Hey everyone! Just a heads-up that John has been released from the hospital and is in great spirits. 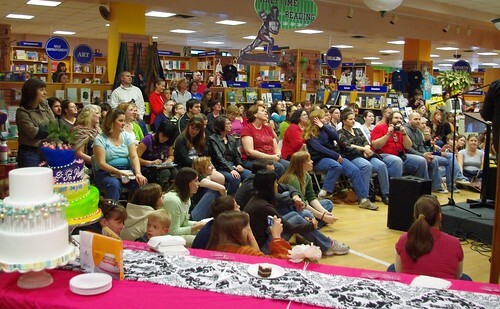 Jen & John have rescheduled their Austin stop, and they’ll be joining us at BookPeople this Saturday at 2pm. Check out the Evite for details!